It was the summer of 1957 when a group of students convinced their professor to sponsor their excursions into the wilderness. From this humble beginning, Laurel Highlands River Tours was born. The professor was Edward Coleman of Indiana, Pa. His willingness to share his love of the outdoors birthed a multi-generational enterprise that has introduced hundreds of thousands of individuals to the outdoor world that surrounds us all. Professor Coleman went on to sponsor the outing club from IUP (Indiana University of Pennsylvania) and would spend the summer paddling various rivers in Southwestern Pennsylvania and eventually, high up in the Canadian backcountry on the Ottawa River. By 1962, Ed started a commercial enterprise named “Outdoor Specialists” and honed in on creating fiberglass decked canoes called C-2’s. These boats were very adept at navigating the swift waters which thrilled those who ventured to participate. They were also strong enough to handle the bashing they were subject to from the rocks in the rivers. As river running gained in popularity, it became evident there was a greater number of people who simply wanted to experience the thrill of whitewater. Out of necessity, the sport of whitewater rafting was born. Beginners could be introduced to rafting with a much briefer instruction period and they would follow the more experienced paddlers on their journeys down the rivers of the East. By the mid 1960s, Ohiopyle State Park came into being. After an exhaustive study conducted by the Pennsylvania Bureau of State Parks on the environmental impact the river would sustain by whitewater rafters, the few adventurous entrepreneurs who had started their businesses prior to the Park’s inception were put under contract in 1973. 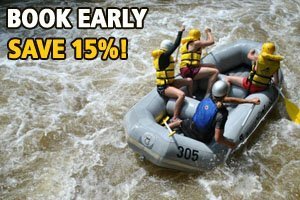 It was at that time the name Laurel Highlands River Tours was created to identify this entity with the region that surrounds this area. Our sister company, Wilderness Tours, was established on the Ottawa River in Canada at approximately the same time and was named to reflect the remoteness of the region in which they operate. As rafting became more and more popular, time became more constrained for an academic professor with three young children to raise. The seasons started earlier and extended into the late fall. By 1978, Professor Coleman had realized that this was now a full time pastime. There was a passing of the torch, with the intent to keep the flame burning, to the current owners Mark and Linda McCarty. Mark had started his career paddling canoes with his father as a Boy Scout at 13 years of age. He helped his father start a whitewater rafting company, Mountain Streams and Trails Outfitters, in 1963. The government, however, had different plans for Mark and he spent three years serving in the United States Army in Vietnam. After his discharge, he was supposed to follow in his father’s footsteps as a tool and die machinist. But, having lived outdoors for the past three years, he couldn’t bring himself to work in the steel mills of Pittsburgh again. He set out for the mountains to seek his fortunes. His greatest fortune was to meet his wife Linda, who was born and raised in Ohiopyle. Linda had helped her parents, Bob and Shirley Marietta, start up another of Ohiopyle’s new whitewater rafting companies, White Water Adventurers. They married in the fall of 1973. As the sport of whitewater rafting’s popularity exploded, Mountain Streams and Trails Outfitters grew to an extremely large three-season operation. It was then that Mark’s brother, Michael, joined the company after earning a college degree. The time was right for Mark and Linda to branch out on their own. After having made numerous first descents on rivers, it was time to try it in business. In the spring of 1978, Mark and Linda assumed ownership of Laurel Highlands River Tours. They have enjoyed raising a family, as well as many generations of guides and staff over the last 40 years. Mark and Linda have been joined over the years by their children as they have grown of age to help in this family-run enterprise. Each child was expected to help out when they turned 12 years old. One by one they have stepped in to assume responsibility in attending to our guests’ needs and desires. The oldest daughter, Stacey, manages the Ohiopyle House Café and Marietta Tavern. Jamie handles the e-commerce side of reservations with the help of our office manager Tammy. Next to join the team was Elizabeth, who with a degree in accounting, took over on the retail operations. Patrick, the youngest, spent his senior year of high school acclimating himself to river running by touring the world paddling the best rivers on the planet. Now the grandchildren are stepping up. Mackenzie became the youngest U.S. Women’s Wildwater Champion at age 14 and earned her place on the U.S. Wildwater Kayak Team to compete in Switzerland. She also became the youngest person to be recognized as a professional guide in Ohiopyle State Park history. The extended family here at Laurel Highlands has been the integral part our success. Our General Manager, Terry, has been part of the organization since 1971. Our bookkeeper, Barb, has been keeping track of the accounts since 1980. Donna, one of our reservationists, has been seeing to our guests’ needs since 1986. And our guide staff is second to none. Their years of experience cannot be duplicated. Bob Stover has been overseeing our training program since 1981, making it the longest continuously-run program in the industry. Many members of our staff, who moved on to successful careers and families, are now coming back to enjoy the experience once again and to share it with the next generation. The unique combination of a first class river located in the Pennsylvania’s largest State Park has attracted international visitors. It also provides a world-class venue for a large portion of the outdoor-oriented population of the eastern United States. Our guests who enjoyed this resource as young people are now bringing their children to Laurel Highlands to take part in the experience and to learn about the world around them. This resource has been preserved so that our children will be able to explore it and learn just as we have. It has been our privilege to have been a part of something so good that has lasted so long. We hope to continue sharing our family’s experiences with yours.